RV Warranties – Yes or No? Barra de Navidad has a narrow and shallow entrance channel. Fishermen cast nets in the lagoon. The serenity in Barra's lagoon is a big contrast to most Pacific coast anchorages. The French Baker makes his rounds. baguettes right to your boat! The Grand Bay Resort overlooks the lagoon. View across the water taxi piers. Barra is loaded with cute little eateries. tourists here during our stay were gringos. A 1921 sloop in the lagoon. blushes as I snap his photo. Mark finds the Beatles in Mexico once again. One of many boat-in palapa restaurants on the lagoon. Water taxis ferry visitors all over the lagoon. of place in a bathing suit and flip flops. Hammocks by the lagoon shore. A yacht traverses the narrow channel. A McGregor 26 (without its mast) slides past us at a fast clip. 48' power yacht that's suddenly on the loose. motoring down a very narrow and very shallow channel. being off by 100 feet will put you hard aground. in less than 10' of water. the air as they settled into the surrounding mangroves. to see which one can be the buckingest bronco of them all. Suddenly the radio came alive with chatter; it was Barra's morning VHF cruiser's net. voice answered, "I have only one." "We'll take it!" came the happy reply. ago and in 2003 created a unique niche for himself in this ex-pat community. our teeth into chocolate croissants and miniature bacon and cheese quiches. flops and beachwear being the accepted attire. can get a little awkward. have enough salad for all of us..."
called us by now if they were here..."
Two men troubleshot a plumbing problem in detail: "You gotta turn that pipe 180 degrees." town?" "La Oficina" came the reply. "La Casina?" "No, La Oficina..."
boat took a dinghy ashore and met the poor fellow in person in the lobby. Grand Bay Resort and wandered through the beautiful grounds. everything about the resort oozes elegance. seeing, panicky voices on the radio abruptly brought us to our senses. at a fast clip right past us. In an instant five dinghies rushed over to the wayward boat. the action feeling rather useless. feet away from him for the past few days. and we draw 6' 6". putting fenders out to save their boat from the impending collision. as the wheelhouse on the boat was locked, so there was no way to start the engine and move the boat under its own power. been stolen in this anchorage over the past two seasons. way a few miles north towards Tenacatita. Visit Anchorages on the Mexican Riviera (northern Pacific coast) to see more posts from this area! This entry was posted in Mexico's Mainland Pacific Coast (North) and tagged Costalegre, Mexico, Mexico's Mainland Pacific Coast (North), Shutterbug, Travel by Roads Less Traveled. Bookmark the permalink. Never miss a post - it's free! Here's some of the GEAR we use and great IDEAS for you! Happy Trails!! Black Hills Back Country Byway – Spring Flowers in Arizona! Traces of Antiquity and the Not-So-Ancient in Utah! SE Utah – A Mars Colony, Wide-Angle Photography & Snowy Mountains! Monument Valley & Hite Scenic Overlook – Stone Towers from Below & Above! Enjoying our Site? Help keep it going! Follow Mark's 500px Photo Gallery! Is Your RV A Few Years Old? What Is An RV Warranty? Triple Tow or Toy Hauler? How to RV Full-time with a RZR? Oops! How does this work? Dog’s Life – Buddy’s Got It Covered! RV Life is FUN and EASY...Good EQUIPMENT makes it even better!! Roads Less Traveled is a participant in the Amazon Services Associates Program, an affiliate advertising program designed to provide a means for sites to earn money by advertising and linking to amazon.com. Copy, reproduction or use of text or images is not permitted without written permission from the author or photographer. 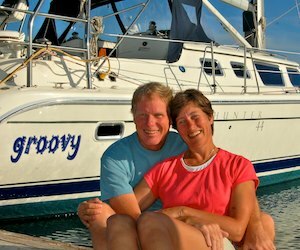 --Emily & Mark Fagan, traveling full-time by RV & sailboat since 2007. Welcome to our site...and enjoy! Going Full-time – Which RV?